We are still creating the same beautiful blankets, however we do not embroider names, dates, appliques or embroidery designs anymore. Available for shipping within 2-4 days of purchase. 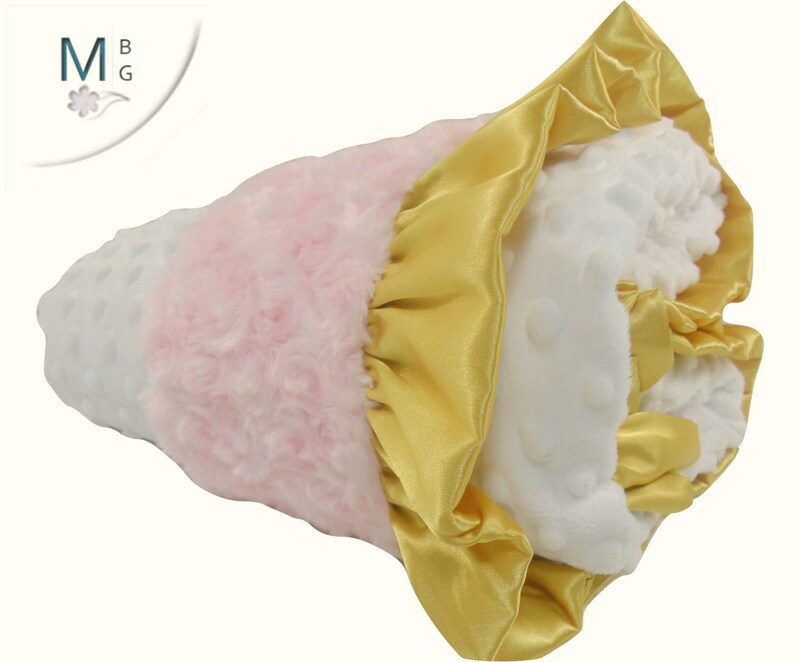 Gold ruffle on pink and cream minky baby blanket. we make it in light pink, hot pink, and fuchsia. Choose your size from the drop down menu. •	18 x 22 Luvy size or travel size, SEE LAST PHOTO BEFORE PURCHASING! This is for baby to haul around PLEASE DO NOT ORDER THIS UNLESS YOU ARE LOOKING FOR A LUVY! you cannot wrap a baby in a blanket this size, it is a bit larger than a burp cloth. it is a travel blanket, a luvy. 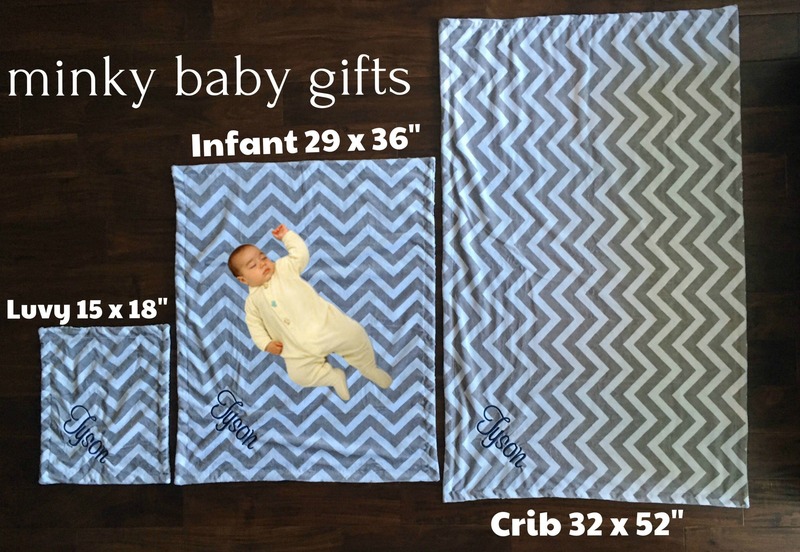 •	32 x 38 Infant size, good for a newborn, and baby shower gift. •	35 x 55 This can be used as a crib blanket , or as an adult throw. It works perfectly for traveling in airplanes, or car, watching tv, reading a book. 1) Choose the size from the drop down menu on each listing. There are THREE sizes, and FOUR embroidery options (no name, one name, two names, three names, you can substitute a birthdate for a name). 2) Choose the size and embroidery option you want. 3) Put the item in your cart. 4) Go to your cart to check out, there will be a 'note to seller' box. In the 'note to seller' box leave the name, font choice (see listing photos for choices) and thread color (our thread color match all fabrics in the shop, just choose from the fabrics in the shop). Of no embroidery font or thread is chosen, we will embroider it as shown in the sample provided. 2-3 WORKDAYS. Every single order placed is made from scratch, completely custom. That said, this time-frame begins after your order is placed, payment is received and ALL of the required information (fabric choices, personalization info, etc.) is received. Note: This does not include shipping time...please allow an additional 2-4 days for Priority Mail within the U.S. International shipping times vary from 2-10 weeks (all shipping times are completely and totally out of my control). Can you include a gift note? Yes! Just include your words in the note to seller box, we will add a card to your order. If you put these in a convo INSTEAD of the note to seller box they may not be included in your gift. Please do as we ask, put them with the order notes. We cannot guarantee a card otherwise. Do you offer gift wrap? We do not. We are fast and streamlined, you will have your order within a week. It will come tied with a bow and wrapped in a bag for security, and ready for gift giving. Can I customize fabric choices? Yes, feel free to create your own blanket from any fabric found in our store, no extra charge, or extra lead time. 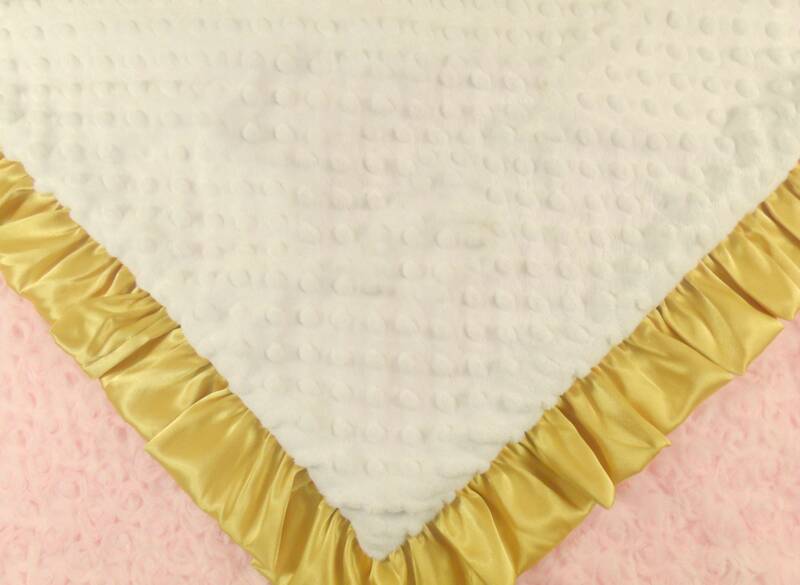 A custom blanket will be finished as quickly as a stock item. 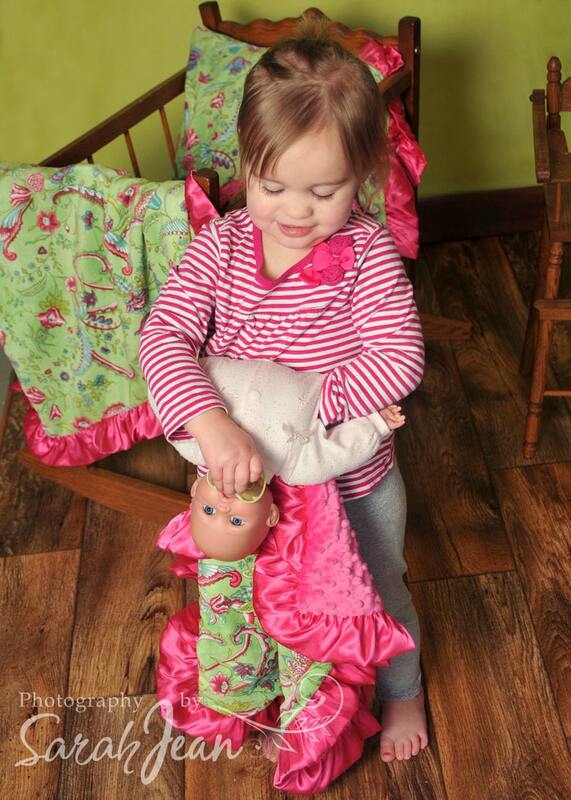 Some of our most beautiful blankets have been customer creations! Even if you want a fabric we do not carry, contact us to see if we might be interested in carrying it. Can I add a ruffle to my blanket? 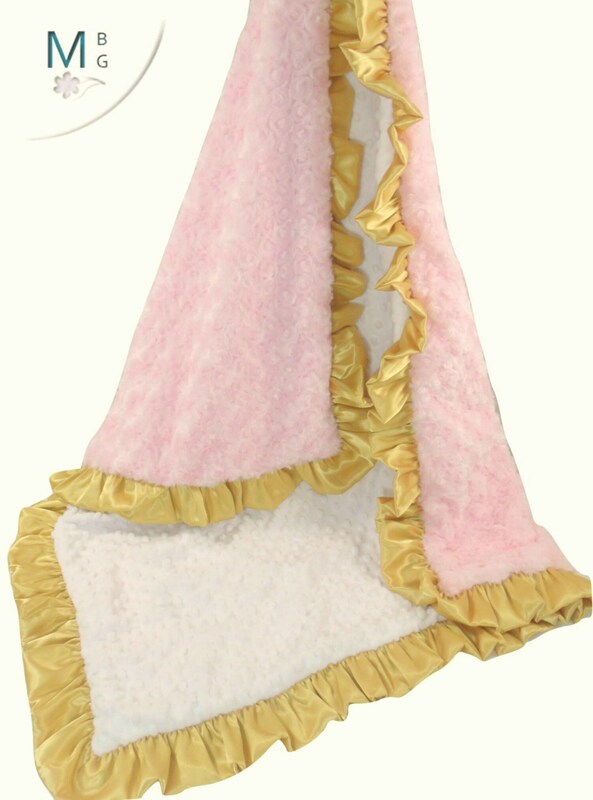 Similarly, if you find a ruffled blanket you want without a ruffle, convo us, we will send a link. NOTE: the non ruffled blankets are smaller than the ruffled blankets. All our fabrics are pre-cut, we cannot make them larger.